Lap it up folks. Last week the U.K. based alternative-rock quartet The Boxer Rebellion unveiled the video for their brand new single, “Diamonds”. We recommend playing the track a few times in succession; the new single is initially understated, varying little in dynamic or key, but after giving it time to digest “Diamonds” reveals itself as just that, an absolute gem. “Diamonds” is the most mature we’ve heard the band in the continual refinement of their sound. A return to form, if anything “Diamonds” is closer, sonically, to the ‘Union’ album from 2009 than 2011’s ‘The Cold Still’. Putting to one side the ballsy and edgier rock sounds of their past, “Diamonds” is an up-tempo but gorgeously subdued number. Lushly textured, there is a warmth to the sound via the addition of synths but make no mistake the familiar melancholy tones that exude from their music is ever present. Vocalist Nathan Nicholson is also more restrained than usual and this only adds to the fragility of the song. 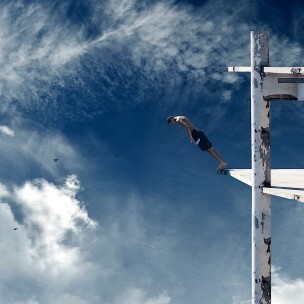 Although always hooky, The Boxer Rebellion however rarely opt for predictable pop writing nor do they go straight for the jugular and “Diamonds” continues this tradition. The song exhibits a similar approach to writing as The National – in fact, “Diamonds” isn’t unlike The National both in mood and songwriting. “Diamonds” is their first track from the band’s upcoming fourth studio album entitled ‘Promises’ (artwork above), which is set for release on 14 May, 2013. Pre-orders for the album will commence tomorrow, 2 April 2013, via The Boxer Rebellion website.